Downtown Bardstown Kentucky. GreatAmericanAdventure.net photo. 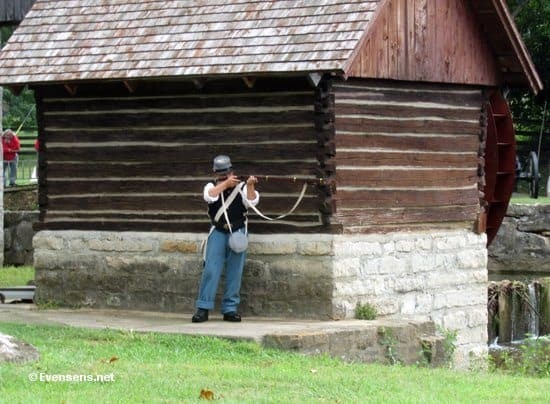 A Civil War re-enactor in Bardstown. Ping, ping, ping …an inebriated Jesse James sprayed the murals at Talbott's Tavern with gunfire. As the story goes, he thought he was shooting at butterflies. If that wasn’t exciting enough to prompt a visit, add Daniel Boone’s stay at the Tavern in the late 18th century and Washington Irving’s stopover some years later. 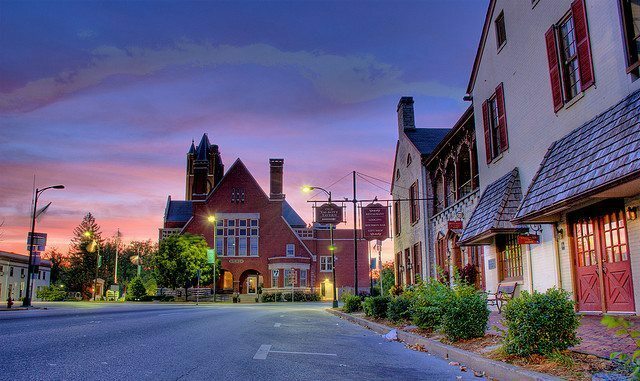 The Talbott Tavern in Bardstown, Kentucky has had quite a history. Abraham Lincoln stayed there as a thirteen-year-old while his parents were resolving a land dispute. My husband and I took the forty-five-minute drive from Lexington to Bardstown, Kentucky. It was only fitting that our first stop was the almost 350- year- old Talbotts Tavern. We had to have a look.Back in the late 1700’s, the Talbott Tavern was strategically located near the end of the stagecoach road that led east to Philadelphia and Virginia. The Bourbon bar at Talbott Tavern in Bardstown. The Tavern has been in existence since the day it opened in 1770 and is on the U.S. National Register of Historic Places. It is the oldest stagecoach stop in the U.S.
Before beginning our exploration, we traversed the lobby and turned left into the Dining Room/Bourbon Bar. An old painting of the inn, complete with stagecoach and horses, graced the wall behind the bar. Next to it, a 21st century TV flickered. And, just outside, the fifty-star American flag was displayed. We sat down for lunch at the Dining Room/ Bourbon Bar. The bartender explained that the Talbott Bar is the world’s oldest Bourbon Bar. Such figures as T.R. Beam (Jim’s brother) owned and operated Talbotts at one time. T.R. later sold it to Tom Moore, distiller (now Tom Moore Distillery). The menu features good ‘ole Southern tavern fare such as Kentucky Burgoon, Old Kentucky Hot Brown and BBQ Pork Sandwiches. I opted for the Kentucky Hot Brown. I was introduced to the world of eggs, cheese, and bacon (repeat)… all in one serving. Not to mention the turkey slices at the bottom. A stone fireplace took up another wall. As with all early structures, the fireplace was a vital heating source. The mantelpiece had been carved out of wood. Atop is an array of pewter ware, and a second lithograph of the inn. 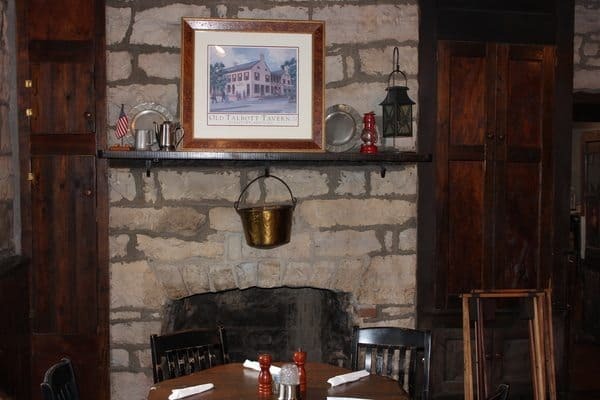 The Tavern, a rare example of Flemish bond stonework, utilizes two- foot thick stone walls and heavy timbers. Two separate fireplaces were used to cook the food. It originally had only two guest rooms on the second floor: one for men and one for women. 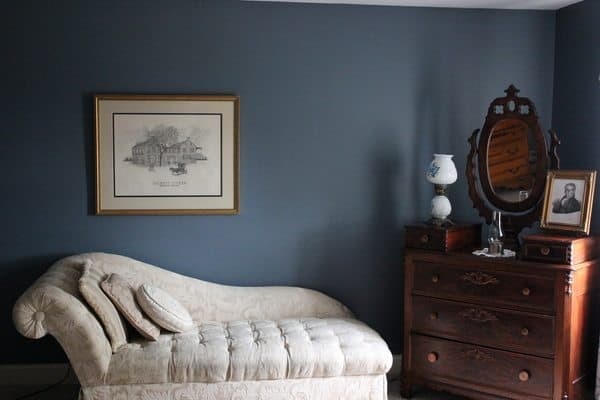 Individual rooms for guests did not become widespread in the United States until the early 19th century. The passage of time was evident as we stepped on the creaking floorboards. Rough-hewn wooden beams fashioned the ceiling. You can almost feel the people who so long ago tread on these very floorboards. We were sort of silent witnesses to history. The walls upstairs are the original stone. The roof and most of the second floor was badly damaged in a 1998 fire. Talbotts reopened on November 9, 1999. The second level features glass cases displaying early artifacts including General George Rogers Clark’s unpaid bill. On March 1998, the Tavern suffered a devastating fire. The roof and most of the second floor was badly damaged. Some of the murals were damaged and have still to be restored. Extensive rebuilding was done. 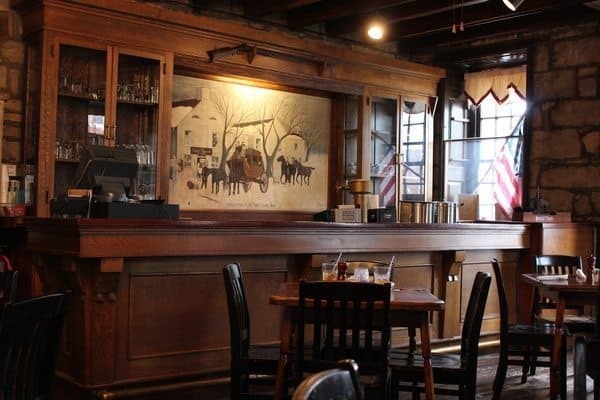 The Old Talbott Tavern reopened on November 9, 1999.The receptionist told us that one item that has been lingering over the centuries is the presence of ghosts: especially that of Jesse James. There are still sighting reports of Jesse’s ghost from time to time. 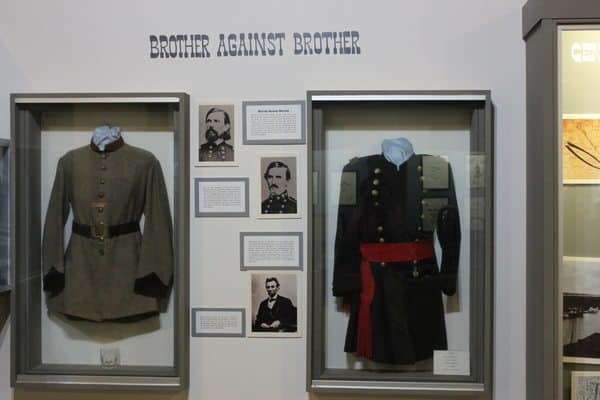 The Civil War Museum, just down the street, is a definite must-see. The War Memorial of Mid- America and the Women of the Civil War Museums are conveniently located next door. All three are located on Museum Row on East Broadway Street. A Museum volunteer explained that camp life was filled with disease. Many of the big killers in Civil War camps were smallpox, measles, and dysentery. Many of the soldiers would build their latrines upstream but gather their water downstream. 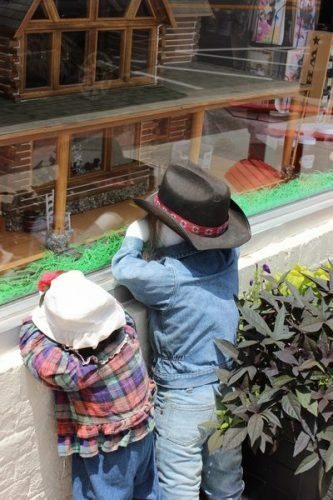 Kids in doll shop window in Bardstown, Kentucky. passive and subordinate. However, about 250 women are thought to have served in the Confederate army disguised as men, with about 400 women serving in a similar manner in the Union Army. A short walk downhill takes you to the Old Bardstown Village which contains log cabins built in Nelson County, Kentukcy. from about 1776 to 1820. If you’ve ever wondered what a frontier community looked like, you can see one here. In addition to the frontier homes at Old Bardstown Village, you can visit shops such as the wheelwright’s shop, a forge, a stillhouse (distillery) as well as a replica of Brown’s Mill. This frontier village represents one of the first westward movements of the nation. The log buildings are well over 200 years old.Federal Hill, where Stephen Foster wrote, “My Old Kentucky Home”, is also to be visited. However, if you are limited for time, it really doesn’t have anything you can’t see in other 19thcentury homes. Before leaving Bardstown, we took a walk along the Cobblestone Path, across from the Civil War Museum. 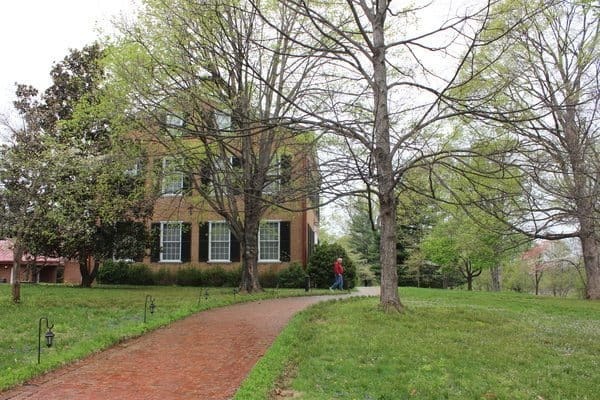 Built in 1785, it was the main entry into Bardstown.